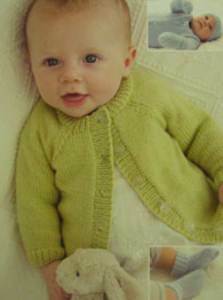 Cardigan: 26-31cm 50g, 36-41cm 100g, 46cm 150g. Hat 50g. Mitts and bootees 50g. 28sts/36 rows to 10cm on 3.25mm needles. Recommended yarn Sirdar Snuggly 4 ply. 2.75mm and 3.25mm needles, st holders.